Mr Lee's Painting Emporium: The Duke of Bavaria! The Duke of Bavaria.. or at least that is the English name. The German name I would write but it would come across as me screaming angrily at you.. so will skip that ( and the poor joke that few will get ;) ). This was my first real competition show where the models and the painting competition take center stage and everything else is secondary. 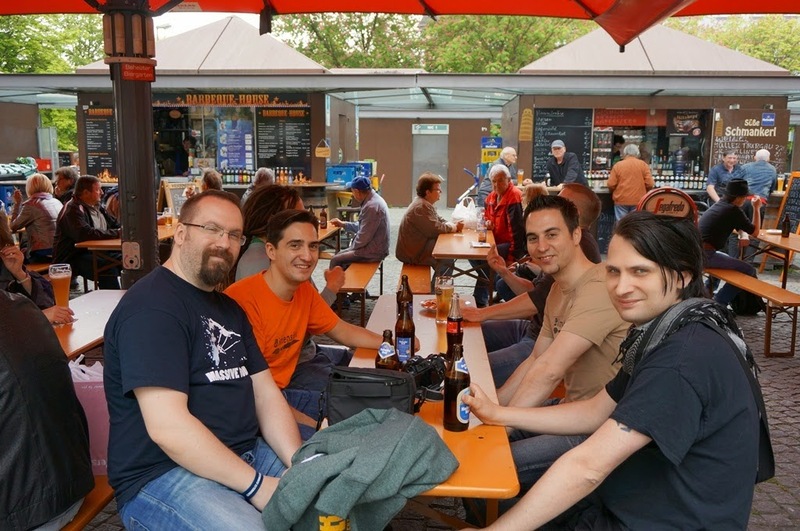 Which is a big change from the past events like Games Day Germany or Salute. Both of which felt more like the painting portions were a far and distant afterthought compared to the vendors and demo games ( thankfully I did not go to GDUK which even lacked Demo games! ). The collection of transport cases ( and more came ) from all the painters joining the event! And since this was my first real competition I was unfamiliar with the rules set of the event. Something that I should have been more aware of since I did join the Bananalicious Contest from Massive Voodoo last year that was using something of a same standard. 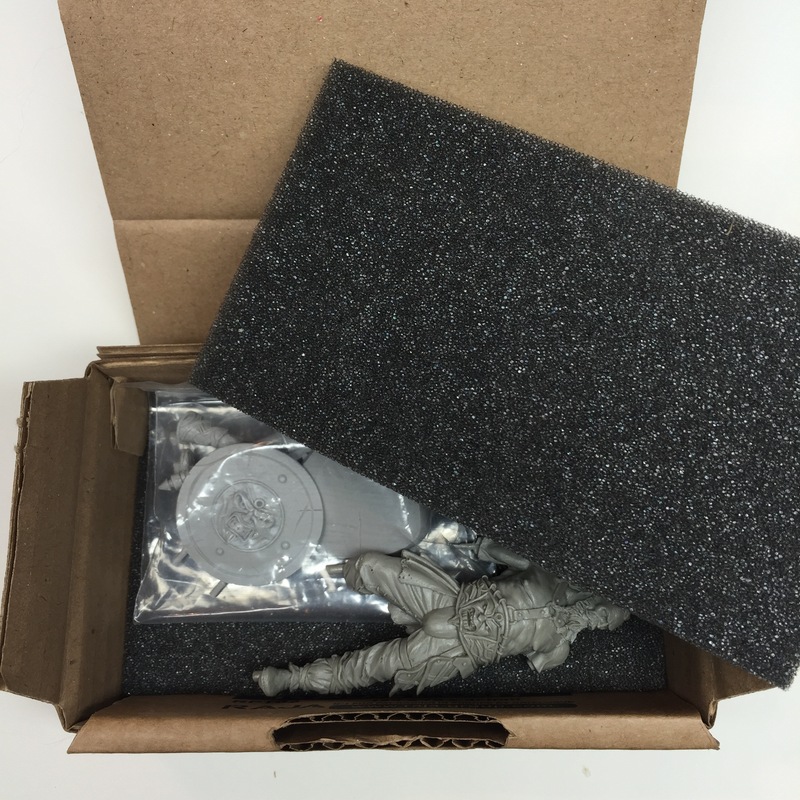 So although there were several categories such as; Standard, Master, Open, Fantasy Standard, Fantasy Master, Fantasy Open, Green Stuff, Diorama and probably a few more.. you actually entered in what was termed Displays to these categories. This display could be as little as 1 piece or upwards of 12 pieces. After a few chats with others though, it was recommended to be in the 4-6 range for a decent sized display. I entered with 2 pieces myself ( with my third not getting finished in time ). Alice from last August and the Alien Sci Fi Bust that was recently finished. There were many other displays obviously and all ranged in quality and size. 3 very nice variants of it painted up and shown off at the competition or at least by the judges cabinets. All of which, alongside the one from H&V in their tutorial, I will be referencing when I get around to painting up my versions! And out of all of these paintings brought by all the painters there is of course the awards and rankings of the pieces. 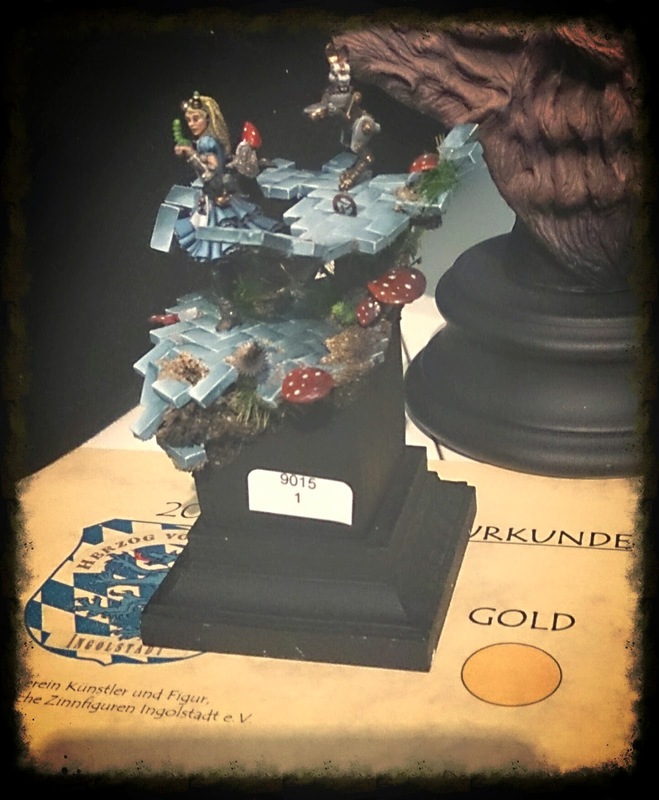 I am happy so say that my little display did pick up a Gold in Fantasy Standard. Something that I was really not expecting at all in the event. Not for my first time out and not after only such a small time of trying to paint higher quality. I was blessed to be able to start the week off with the crew of Massive Voodoo before meeting up with my fellow Bloggers of 5th-dimension and hanging out with them all weekend. And if these were the only people I saw all weekend I would have already been having a blast. But then I got to see, chat, meet up with, hang out with, drink with, joke with, and generally have a great time with everyone else that attended. It was told to me before hand that if I wanted to ask about a piece or chat to someone it only took a Hello to start it. And no truer advice could have been had for such an event! Me and Sydney the German Leprechaun! Who treated me with the Golden Irish Whiskey from Bavaria! Honestly it was all the people at the event that really hit it home for me. All the comments on my pieces which was so well received, but also the chats on other pieces and understanding a bit better of the differences between Standard and Masters category styles. Really felt like home, and I can say that I have not had such an emotional or fun filled weekend away from my family in such a long time. One for the ages indeed and one that still parts of it make me laugh out loud! Heck, even one of my idols in the painting community even gifted me with a fantastic piece STRAIGHT FROM HIS DISPLAY!!!! Thomas Wasch! A lone painter from the northern tribes of Germany... who on more than a few occasions I have tried to meet up with, and finally at the Duke that chance was made! Fantastic guy ( as we all knew ) but to gift me this piece from his Fantasy Master Display! Truly Epic and mind melting!!! A gift that I will have to reciprocate in the future just cause that is how it goes here at Mr Lee's! Still reeling from this generosity, and more from others throughout the event! So a massively-huge-epic-Canadian-performing-German-Suplex-styled THANK YOU! To everyone who attended, anyone who stopped by to say hey, anyone who stopped to chat with me, and in general a massively-huge-bear-styled-hug to all! Just try to stop me from coming to future Dukes now! That event sounds superb!! Your write-up really makes me want to attend :) Thanks mate! Was a fantastic event mate.. Top of my list at the moment for next year! Heck I might even enter next year again also, though am going more for the people and liquor! Munich and this week at a glance..